Software development for Marinos Koutsomichalis’ Inhibition project. 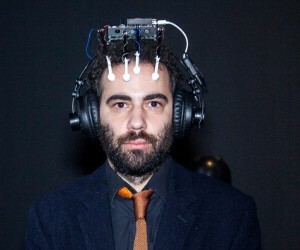 Inhibition revolves around an ‘intelligent’ headset that is capable of EEG (electroencephalography), algorithmic sound synthesis and machine learning. 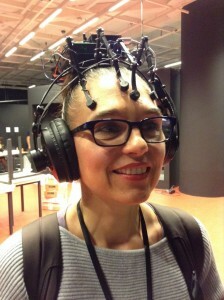 With the headset on, neurophysical activity is constantly monitored and those particular kinds of sounds that are most likely to inhibit concentration are generated, hindering direct man-machine coupling and destabilising the subject’s cerebral rhythms. Software, 3d-printable models, schematics and a cnc-millable pcb design are all available through github. Inhibition is an artwork by Marinos Koutsomichalis commissioned by Ars Electronica and the Onassis Cultural Center. 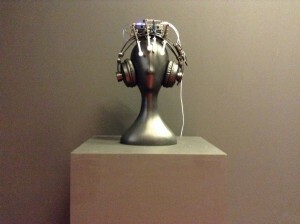 Inhibition headset. Athens 2016 (c) Marinos Koutsomichalis.